Extruded polystyrene boards, it is manufactured as closed cell by continuous extrusion process in accordance with international standards. ISOBOARD® is the only product in the market with (Zero flame-spread) according to UL Laboratories. 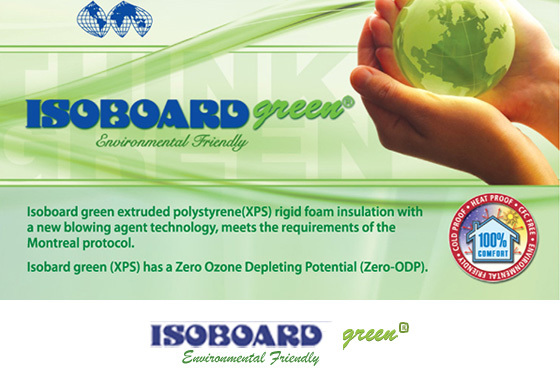 ISOFOAM, a leader in building materials and energy efficiency solutions, today has started manufacturing zero ozone depleting ISOBOARD®Green extruded polystyrene rigid foam insulation. The new blowing agent technology meets the requirements of the Montreal protocol which requires the phase-out of the hydro chlorofluorocarbon (HCFC), an ozone depleting compound. 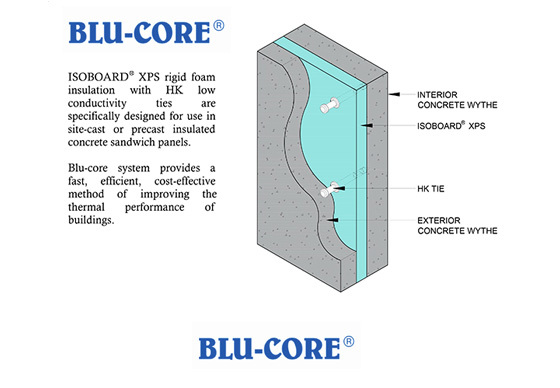 Blu - Core tiles are designed for use in insulated concrete sandwich wall panels. Blu - Core ties manufactured from high performance, heat and alkaline resistant, engineered polymers. 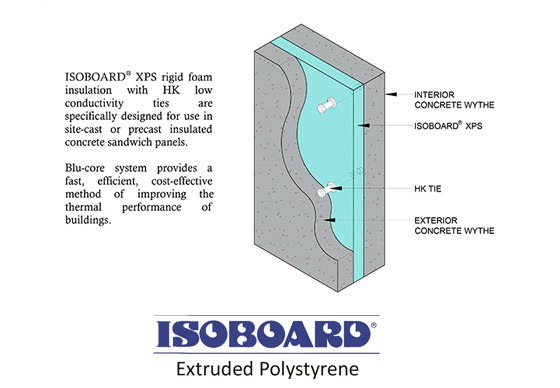 Blu - Core ties minimize the energy draining effects of thermal bridging experienced when metal ties or solid concrete sections are used to connect the concrete Wythes of sandwich panels through the insulation layer. The use of Blu - Core low conductivity ties results in a sandwich panel with maximum thermal performance. Blu - Core tiles approved and accredited by Dubai Municipality. Blu - Core tiles approved and certified by Dubai Civil Defense. (100% Acrylic Solid Surface) is an ideal material for residential & commercial building applications such as countertops, vanity tops, and kitchen tops etc. 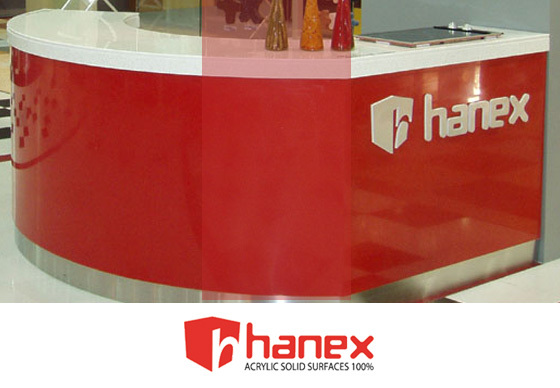 HANEX® can be joined & thermoformed without visible seams. 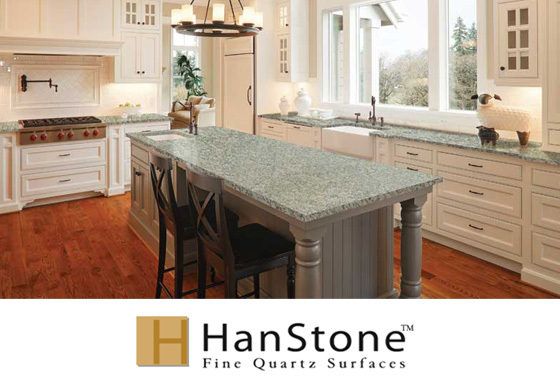 HANSTONE® begins with the natural luster of fine quartz, bringing to it a sheen and richness that are the essence of luxury. With a strength that is two to three times greater than other natural stones, HANSTONE® is an excellent choice not only for kitchen and bath countertops but also for flooring, lobby walls, and other demanding commercial applications, HANSTONE® provides a non-porous surface that won't be stained or discolored by heavy use. It also safeguards against bacteria, making it an ideal to residential and industrial kitchens. It never needs polishing, resealing or heavy cleaning. Simply clean with soap and water – it's that easy!